In this video, Michael takes you through the contents of the iseekblinds Plantation Shutter Sample kit. Each kit includes 2 x shutter panels (1 x PVC & 1 x Basswood) and the following frame examples - Inside Mount L Frame, Inside Mount Z Frame, U Channels, Outside Mount L Frame and a T-Post in bothBasswood & PVC. All the parts are clearly labelled. Select the frame you are considering, pair it with one of the panels and physically place these in your window to check clearances required for a perfect fit. These kits will assist you greatly in understanding the How to Measure process to ensure you get the best possible result for your Plantation Shutters saving you $1000's with Michael's easy DIY guidance. 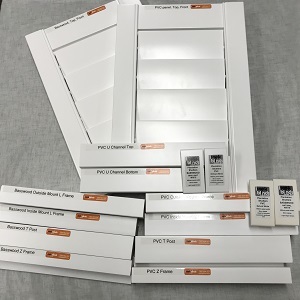 To provide the best online purchasing experience possible, our Plantation Shutter sample kits contain 2 x Panels and examples of each of the various frame options available. In order to provide this, iseekblinds needs to ensure we receive the Plantation Shutter Sample kits back in full and undamaged. The Sample Kit is then dispatched via courier. Day 18 - If iseekblinds has not received an email requesting collection and/or samples have not been returned, then you will be charged $250. Repack the kit back into the box it came in and apply the enclosed self-addressed label - make sure you cover the original freight label. If the Sample Kit is returned with missing or Panels, a $50 charge will be applied per affected Panel. For any missing or damaged Frames, a $25 charge per item will apply. If the Sample Kit is not returned within the 18-day timeframe, iseekblinds will consider the samples ‘sold’ and apply the Token payment of $250 in order to replace the samples. If the samples are received in full and undamaged after this timeframe, (up to a maximum of 60 days) iseekblinds will issue a refund, of $190, retaining a $60 admin fee.